Defense Minister Ehud Barak says it is likely Prime Minister Binyamin Netanyahu will agree to divide Jerusalem with the Palestinian Authority. Defense Minister Ehud Barak says it is likely that Prime Minister Binyamin Netanyahu will agree to divide Jerusalem with the Palestinian Authority. Barak told the Hebrew-language newspaper Haaretz in an interview published Wednesday that he believes the best chance for peace lies in a peace deal in which all the Arab neighborhoods in Jerusalem would be handed over to the PA in order to create a capital for a new Arab country. 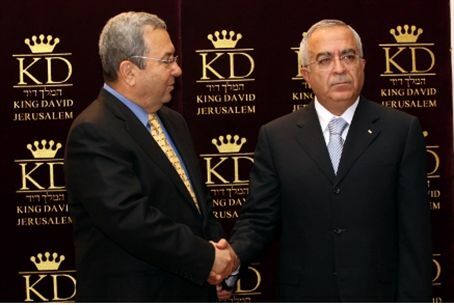 In addition, Barak envisions a “special regime” with “agreed-upon arrangements” to administer the Old City, the Mount of Olives and the City of David. Prior to his re-election as Israel's prime minister nearly two years ago, Binyamin Netanyahu warned a gathering at the Jerusalem Conference in January 2009 that leftist politicians would try to internationalize the holy sites in Jerusalem – and he vowed to fight the move. Four Jews -- two men and two women, one of whom was nine months pregnant -- were shot to death by a Hamas terrorist cell on Highway 60 at the Bani Nayim junction, between the Jewish community of Pene Hever and Hevron just as darkness fell, ending the daily Muslim fast of Ramadan. According to security sources, the terrorists had "confirmed the kill" by approaching the car and firing at point-blank range once the victims were already either seriously wounded or dead. Ten children were orphaned by the attack. Barak countered demands by outraged politicians and community leaders for Netanyahu to return from Washington, saying the attack had “no doubt” been an attempt to “harm the start of the peace talks” and urged Israelis to support the process.